As I mentioned in this thread, it's unusual to find HV and LV running on the same poles in the U.K., other than where they meet at a pole-top transformer. So there you have it: HV and LV sharing a grand total of three spans! This is certainly odd to us here in the States as almost all poles have combined systems. A typical pole in my neighborhood will have the following. If it is a 'Local' power company you may also find other town wiring...in my Town the local power company adds PA speakers to the poles surrounding a fair ground. Last edited by iwire; 09/03/07 03:02 PM. [If it is a 'Local' power company you may also find other town wiring...in my Town the local power company adds PA speakers to the poles surrounding a fair ground. 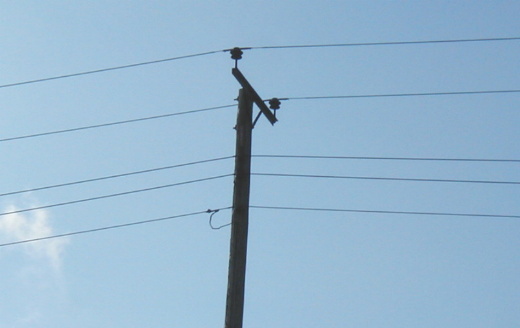 This is a thread jack question, but I have always wondered in the case of a municipal/regional/co-op utility, does the telephone company still own the poles as they usually do? Here in NA and I think other local Dept's you will find a mix of Tel Co and Municipal owned poles. I have no idea how that evolved. I know when the local power company installed new taller poles so they could add more high voltage circuits above it literally took years for the Telephone company to come out and shift their cables over to the new poles. I think it's because the telegraph system predated the electrical system, so the telco's monopolized ownership of the poles. Though I'm sure if I'm wrong about that, someone here will hopefully chime in. Yeah, they don't seem to jump on that, do they? Down the street from me they replaced a pole that was snapped in a car accident. They left a fragment of the old pole (leaving only the telco lines on it) attached to the new one with their heavy bailing wire. They still haven't moved the telephone lines over to the new pole and removed the old pole fragment. That happened 2 years ago!! Lovely photo's of rural England. Interesting to see the additional earth, to support the MEN system on the 3 rd photo. It is common in NZ to find multiple voltages, phone and scada hanging off the same pole. 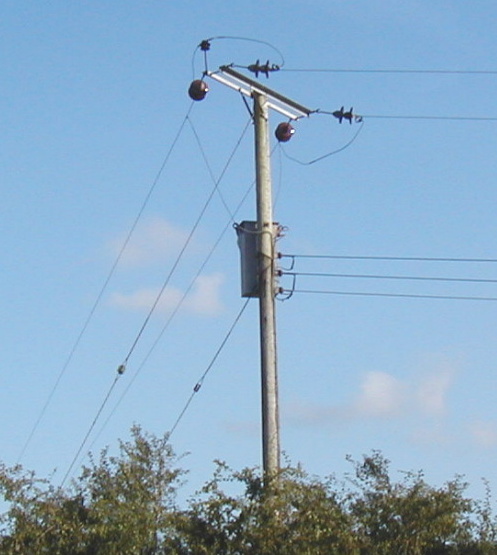 Most poles are POCO owned in NZ but we have still Phone Co poles with a power top on it which is usually 230/400 Volts. 11kV feeder on top the 240/415V consumer mains is normal in this part of the world. In fact I have an 11kV aerial feeder right outside my house, with the 240V house main supply only a few feet below it. Needless to say, there are insurance claims when the 11kV gets mixed up with the low voltage mains as a result of a car crashing into a pole, or a carbonised possum dangling between the two supplies. 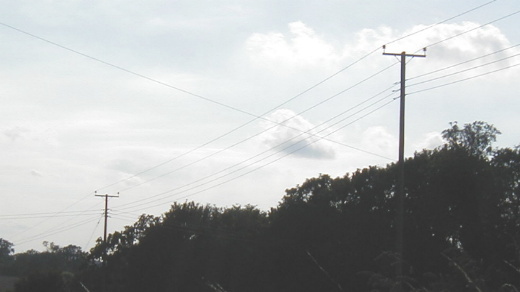 Above ground telephone cables are only seen in a few less densley populated suburbs and then mainly in outlying or rural areas. They share the power poles where available, otherwise Telstra provides the poles. When cable TV came to Australia in 1995, one of the operators decided to use aerial cables, as is done in the US, and so had to pay for use of the poles which were claimed to be the property of the electricity supplier. As to what is done when a power pole is replaced, I've seen two things; one is that the pay TV cable is left hanging until the cable operator reattaches it, the other is the old power pole is left in situ, but cut down to just above TV cable. The other cable operator, pulled their cables through the existing underground phone ducting, often damaging the phone cables. There was alot of whingeing about the aesthetics of the TV cables to the point where some councils banned them, thus preventing Optus having any pay TV customers in certain areas. 12 years down the track of course everyone has forgotten about the pay TV cables but now have ideas of increasing electricity charges to pay for putting the supply underground. It's common enough to find telephone running below 240/415V in rural areas here, just very rare to have anything else on the same poles with HV. I think "townies" probably find even shared LV power/telephone odd sometimes as they're not used to seeing it as much. One of the things which is very noticeable about Britain compared to the U.S. is that as soon as you reach any sort of town the power distribution is far more likely to be all underground here. This is even the case in relatively small towns. 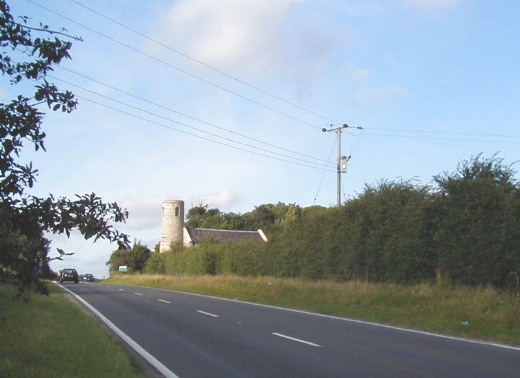 Stalham, about 5 miles from here, is a good example. This is a small town of about 3500 people. The 33kV feeder to this whole area comes in overhead across the fields to the main area sub-station at one edge of town, and there are 11kV overheads from there which distribute out around the surrounding countryside. But within Stalham itself, both the 11kV feeds to the final xfmrs and the 240/415V distribution are all underground. But within Stalham itself, both the 11kV feeds to the final xfmrs and the 240/415V distribution are all underground. That is also the case in the "warm" states like Arizona, California, and Nevada. It's very similar - the high voltage stuff is overhead and then dives underground for LV distribution. And of course, the dense parts and downtowns of most American cities is 100% underground. Here is a photo from a powerpole at Sunset Road, Glenfield, North Shore with 4 different voltage levels on the same pole. Double circuit 110 kV , single circuit 33 kV, double circuit 11 kV,then 230 / 400 Volts 3Ø 4W and Hot-water and Street-light pilots.